666 Park Avenue Review: What's In the Box? Who (or what) is Gavin Doran? There's certainly a human side to him, as evidenced via his love for Olivia, but it's easy to forget all the nasty, scary things that seem to surround him with every move he makes. He's fantastic at manipulating people and getting them to do things for him. He's content in getting rid of anyone that gets in his way. It's even been suggested (metaphorically?) that he's a monster beneath the perfectly tailored suits. And while we get to see him every episode, and in a way fall under the spell of his charm and grin, he's not really a nice guy. Yet are we to assume that the blackmailing Victor Shaw is the good guy of 666 Park Avenue or just another bad guy fighting for power? It's no surprise that "Diabolic" continued to build upon the many questions already swirling around the show. The most prominent one: What the heck is in that box? I can just hear Brad Pitt screaming out the question over and over, but instead of seeing Gwyneth Paltrow's head, viewers got to glimpse the traitor Samuel Steinberg. That's not really a present I'd want to open. However, the mysterious box that Gavin and Victor were discussing has larger repercussions than a severed head, though we can only begin to guess what's trapped/locked/stored inside. It sounds as if perhaps a former stalker of Olivia's was put in the red box, but after seeing the one guy die from opening it, the supernatural possibilities seem endless. That and Gavin's determination to protect Olivia and stomp out his enemies. It is interesting that both the doctor, who turned out to have a gambling addiction, and Kandinsky made it back for another episode. There's so many times where you get the feeling that characters like that will pop in and out only to be forgotten, but I like that we're exploring them further, and in a way, really seeing exactly how Gavin works to control everything. On the opposite end of the control spectrum was Jane, losing her sanity and gaining her sixth sense. I can imagine how discouraging it would be when no one believes your stories of an ax murderer. Jane really seemed terrified and confused throughout the episode, and for once, she made the most rationale decision in any scary movie or TV show: Get out of the haunted place. Obviously love and her newfound connection to the ghost girl Jocelyn, her grandmother, will keep her around, but it was great to see her struggle with everything that was happening. And the Henry and Jane fight over moving away was so grounded in reality that I forgot it was fiction. It was like a real argument, with Jane pleading for Henry to believe her, Henry frustrated with what was happening and the two struggling to keep their relationship from falling apart. 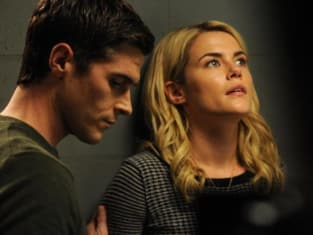 Both Rachael Taylor and Dave Annable were fantastic and I hope they continue to give us great moments (although sad for the characters) like that. I was also pleased when Henry angrily told Laurel that he wasn't single and that Jane was apart of his life. Sure, they aren't married and on paper, Henry is single, but in his heart he's with Jane. Although, I could tell that Laurel's thought process was beginning to seep through. I can almost see characters like Laurel or even Detective Cooper causing relationship problems and maybe even mini love triangles. This is the Drake after all, home of the seductive and desired. 666 Park Avenue continues to trek along at a good pace, paying homage to scary flicks like Psycho, developing relationships and giving us plenty of questions to rack our curious brains. With the addition of Gavin's nemesis, Victor Shaw, and the potential to really dive into the mythology of the Drake, I'm becoming more intrigued by not only what's in the box, but what it all means.